For many being seen kissing their boyfriend in public is nothing but normal. But for Selena Gomez it was 'the most humiliating thing that's ever happened' to her. The 19-year-old says when she was caught in a romantic cinch with Justin Bieber by a Kiss Cam this week, she was mortified. 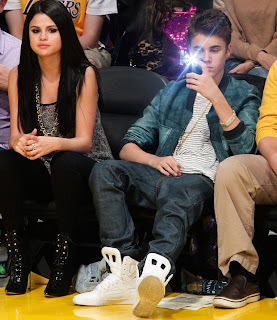 The actress and her boyfriend were watching the Los Angeles Lakers play basketball on Monday night when they appeared on the court's Kiss Cam - which zooms in on couples to make them lock lips - and although they complied, Selena was enormously embarrassed. She told host Ryan Seacrest on his KIIS FM radio show: 'It's the most humiliating thing that's ever happened to me, probably. 'They were showing these little elderly couples, and it was so cute. Then all of a sudden we're both looking up and we come on the screen and it's like... It was so awkward. Selena also talked about 'Boyfriend' singer Justin's new track which he wrote with Taylor Swift. She explained: 'They wrote a song together and it's beautiful - it's amazing - I don't know if it will make the album, but if not I'm sure they'll release it at some point, because it's a really great record. Justin's third album 'Believe' will be released in June. Meanwhile Selena has attempted to add some spice to her sweet as candy image by releasing a new raunchier music video for her single Hit The Lights. The teenager treated her fans to another side of her as she slipped into a a couple of racy corsets to capture her new look. Selena is sure to set the pulse of her boyfriend racing, after he sees her style choice in the blue PVC corset.